You're reading a tutorial on the subject of how to use Second Monitor Lightbox so I'm going to assume you have a second monitor attached to your PC or, more likely, laptop that you are planning to use as a lightbox for the purposes of flat frame acquisition. If not, now's the time to find something else to read. First things first: you'll need to point your telescope at the second monitor. Obviously, you'll be doing this after a photo session and with your camera still set up on the telescope in exactly the same position (and with the focusser still in the same position) as it was for the photo session. The best distance between the scope and the monitor would depend on your particular set up so that's up to you to find. Personally, I put the monitor on a top of a crate underneath the scope and point the scope directly down at it. 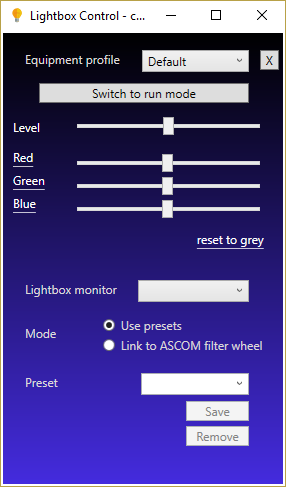 You can choose to use SM Lightbox in one of two ways - using presets or using ASCOM. 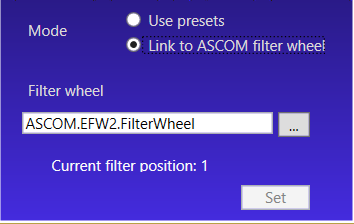 If you have a filter wheel that's supported by ASCOM, I would go the ASCOM route. It's easier to calibrate and more automatic to use. But we'll cover both modes of operation here. 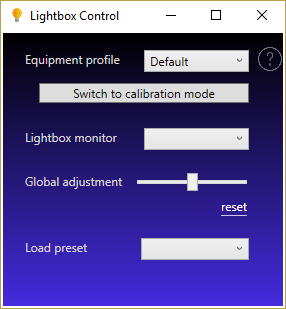 The purpose of calibration is to set an exposure time and brightness level of the lightbox window that combine to give a flat frame with an exposure of around half the full brightness of the sensor. By that I mean, the image histogram would show a peak at about the half-way point. Or, more accurately, the mean ADU level is around half the full-scale ADU. So, if you're using a 16-bit sensor, the maximum ADU would be 65535, so to get a 50% brightness flat, I'd aim at an ADU 32767. But, I have seen a lot of recommendations that flats should be about 30% brightness or an ADU of 20000. So, that's what we're going to target in this tutorial. Whatever level you aim at, the calibration process is all about setting things up to achieve that level for each filter. If the grey 'lightbox' appears on the wrong monitor, use the Lightbox monitor dropdown to select the right monitor. The first thing you'll want to do is go into calibration mode. There's a nice big button at the top of the control window to do this. You have now connected SM Lightbox to your filter wheel driver. So, whenever the filter moves, SM Lightbox will detect it and act appropiatetly. Now, start up the software you'd use to capture the flats. I use Sequence Generator Pro for astro-photography, so I'll use that in this tutorial. The details will obviously vary between different software but the basic principles will hold. Start SGP and connect to your gear. 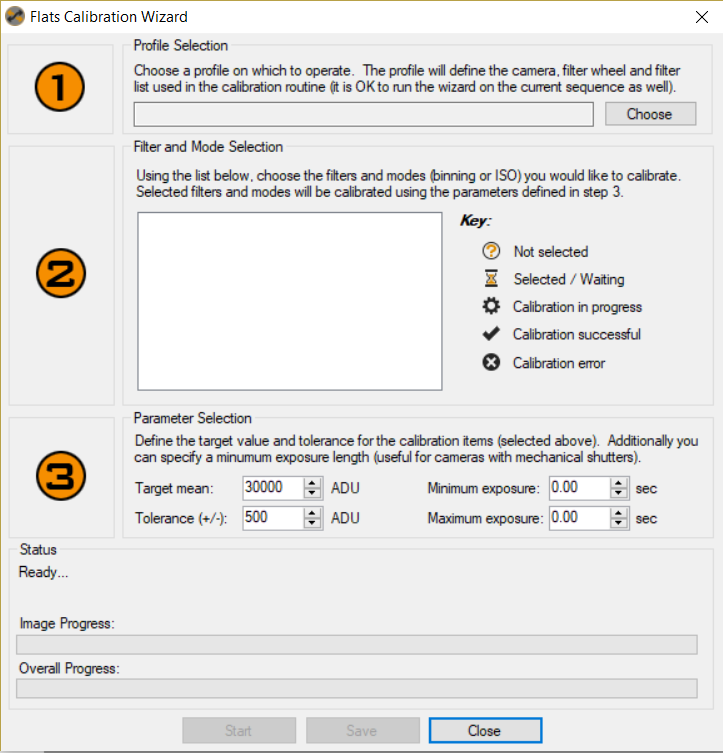 We'll be using the Flats Calibration Wizard - which is built in to SGP - to set the exposure for each filter. But before doing that we'll find a good ball-park calibration using the Frame and Focus tools. Now, in the frame and focus docking module, set the binning to the binning you use for this filter and pick a suitable exposure time. I usually use something around the 2 second mark. What we're aiming to do is find a combination of exposure time and brightness of the lightbox window that results in an exposure value of about 20,000. 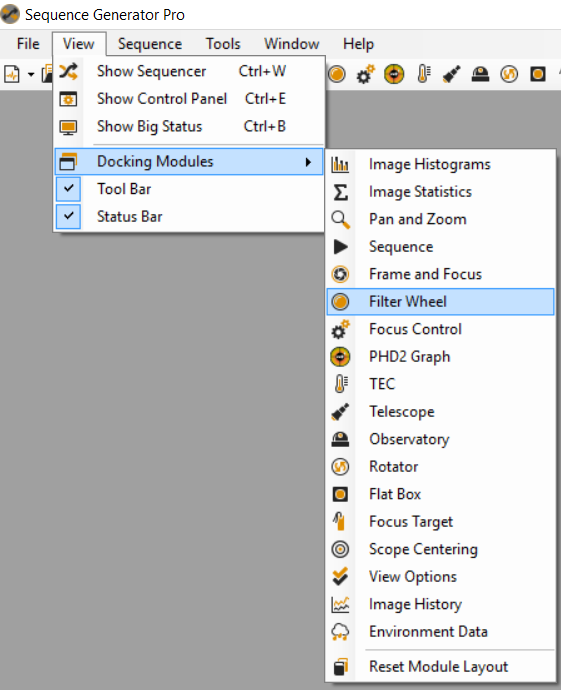 Make sure you have the 'Image Histogram' and/or Image Statistics docking modules visible and click on the Start button in the Frame and Focus module. This will repeatedly take one second exposures and display them along with their histogram and/or image statistics. Chances are that the image will be completely white or, in any case, nowhere near the target of 20,000 ADU. You now need to adjust brightness of the lightbox so that we get a more usable exposure. The slider control labeled 'Level' is what you use to change the brightness level. Grab this and move it left or right while watching the histogram or statistics module in SGP until you get the level you need. You may want to change the brightness settings on the monitor itself as well to fine tune the exposure. You can also use the colour mix sliders to change the colour of the lightbox image. This is useful feedback so that you can see the light has been changed for the correspnding filter - i.e. when taking flats for the red filter the light will be red. The next step differs between Presets and ASCOM modes. In Presets mode: When you have the best level for this filter, enter a suitable name - such as 'L_Filter' in the preset field and click Save. That level will then be recallable as a later time by using the preset name. We'll see how to get SGP to recall a preset later. In ASCOM mode: When you have the best level for this filter, click the 'Set' button. Repeat the above process for each filter and binning level. Change SM lightbox back to run mode using the button at the top of the window. You can also click the 'Stop' button in the Frame and Focus SGP module to stop taking exposures. The next stage is to run the 'Flats Calibration Wizard' in SGP to fine tune the exposures and store the values in the SGP profile. The process is quite simple, start the wizard from the Tools menu. The wizard is split into three sections labeled 1, 2 & 3. In section 1, pick the profile you want to operate on. In section 2, you will see a list of the filters found in the profile and under each filter a number of binning levels. Put a tick by the first filter/binning combination you want to calibrate. In section 3, set the target mean ADU. As mentioned earlier, we're aiming at 20,000 for this tutorial. The tolerance of +/- 500 is fine. Also, in section 3, set the target exposure. I go for a minimum of 1 sec and maximum of 3 secs. If you're using Presets mode, you need to go back to SM Lightbox and pick the preset that corresponds to the filter/binning combination ticked in section 2 from the presets drop-down menu. Now, when you click 'Start' SGP will perform lots of test exposures to find a good exposure. As we've set the lightbox to the right brightness level for this filter we should see that SGP finds an exposure around the 2 second mark. That's it. You now have a fine set of presets - one for each filter/binning combination. Also, tick the 'Prompt to place flat box' option - that'll give you chance to set up the lightbox monitor. So, set the number and click OK. Do that for each filter and save the profile. Now that you have everything calibrated it's time to collect some flats. First open the sequence you will be shooting in SGP. The Flats Wizard in SGP (from the Tools menu) will helpfully create the flat events for a target from the data stored in the profile (i.e. the data we just created when calibrating). 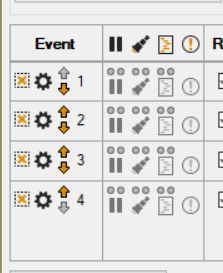 I would recommend adding the flat events to a new target. If you're using ASCOM mode, that's pretty much all you need to do. When SGP runs through the flats target, it will set each filter in turn and SM Lighbox will adjust the brightness accordingly. 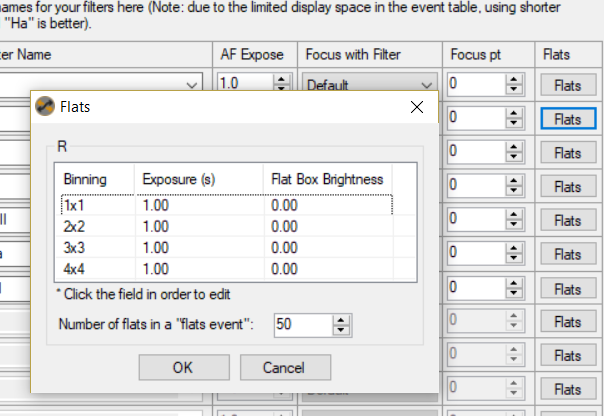 If, however, you're using Presets mode, you're going to need to go into the pre-event options for each event in the flats target and run a script to set lightbox to load the appropriate preset. SGP allows you to run a vbs script before running each event, so we utilise this nice little feature to run the preset script for each filter/binning combination. 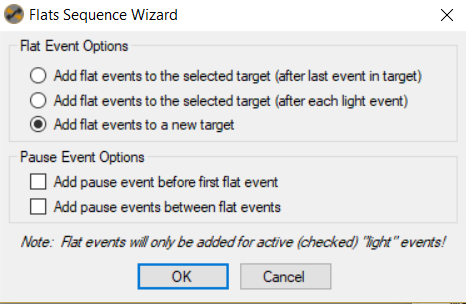 Click OK and do the same for each event. Then you're ready to go. Run the sequence to collect the flats. If, when you're collecting the flats, you notice that all the exposures are either too dark or too light, you can make a change to the Glocal Adjustment slider to temporarily change the brightness level of all the preset levels.